Renowned historian and broadcaster David Starkey has been quoted as saying “Hever Castle, once the home of that great figure of Tudor history, Anne Boleyn, now has one of the best collections of Tudor portraits after the National Portrait Gallery.” Whilst it may be second in terms of collection size, Hever Castle’s distinct advantage is its breathtaking setting in a moated, pristinely preserved Tudor castle in the Kent countryside, meaning that its period artwork can be viewed in a corresponding period property. 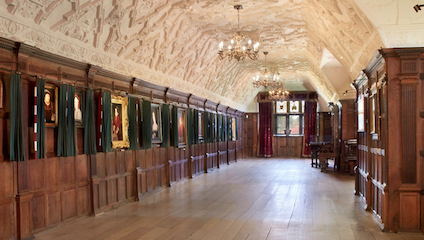 This was the motivation for the brand new curation of the Hever’s Long Gallery, in which Starkey himself was commissioned to rehang a collection of Tudor portraits the way it would have been organised back in the 16th Century, so that visitors would be able to “look at Tudor portraits through Tudor eyes”. Long Galleries were originally a feature of Tudor homes intended for exercise, and viewing the garden, as well as displaying artwork. Starkey’s first impression before the transformation of Hever’s Long Gallery (which was originally build by Anne Boleyn’s father, Thomas in 1506) was that “it looked like an attic, it was so random” he explained during our visit and tour. But it is far from random today. Organised in neat succession, the gallery is populated with lines of chronologically arranged royal portraits, acting as a family tree of the Tudor dynasty, much like a gallery may have been set up as a training tool for young Prince Edward (later to become King Edward VI). But the restoration hasn’t created an exact replication of the Long Galleries of yester year, as Starkey recognises that you can’t completely transport people back to the 16th Century. “You can give a flavour” though, he says, as he goes on to point out distinctive features in the gallery. The ceiling has been painted with an off white to give the effect of lime wash, and most notably, the exhibition is set apart by hanging every portrait with fitted curtains. Starkey explains that this Tudor practice was “designed to protect the paintings from harsh sunlight”, but also for decorative effect, and to elevate the portraits from mere paintings to iconic status. The curtains’ colour has been carefully considered, and a dark Holbein green was chosen. However, the most interesting this about them is their red or white trimming, which denotes whether the people in each portrait belonged to the House of York, who’s famous symbol was the white rose, or Lancaster, who we discovered invented the red rose in order to have a similarly rousing symbol at the Battle of Bosworth. “If you’re dealing with somebody who’s got a strong logo, you need a strong logo!” Starkey explains. Of course as you come to later portraits, they are trimmed with alternating red and white, to denote the symbolic union of the two houses that is the famous conclusion of Shakespeare’s Richard III. The most pleasing aspect of a tour round the gallery with Starkey is the parallels he draws between the stories behind the Tudor portraits, and contemporary issues. Of course Brexit was one of the first topics to come to the forefront, as he’s previously been quoted in the news as calling Henry VIII the first Brexiteer, and is set to do talks on the subject in locations such as Canterbury Cathedral, comparing his divorce from Rome and ensuing negotiations to our current turbulent relationship with the European Union. As well as the link between Brexit and Henry’s Roman rejection, Starkey even (tongue in cheek) tries to convince us that Henry VIII was the original feminist, due to being the first monarch to allow female succession, championing his daughter Mary and granting her the title Princess of Wales (to this day she is the only woman to be Princess of Wales in her own right), marrying his mistresses, and generally being quite romantic and affectionate with his wives… until he chopped their heads off of course. This portrait of Elizabeth Woodville is one of the most notable painting in the new Long Gallery display, not only due to the interesting back story, but because portraits of her are extremely rare, and this particular one has only just been acquired. Another portrait of note is that of Prince Arthur, the older brother of Henry VIII and the heir to the throne before his death in 1502. It is the only portrait painted of him in his lifetime, and Starkey has stated that it is one of his favourites from the Hever collection, referring to it as a “positively jewel like”. His enthusiasm for it is evident during our tour, as he describes the mythic background behind Arthur, who was so named to link him to the legendary King. His birthplace of Winchester was even engineered, as the city is thought to be the site of Camelot. Although every visitor to the Long Gallery won’t be able to have a private tour with the famous TV historian, Hever Castle and Starkey are developing an audio guide, so you can, like we did, discover the people behind the portraits, and experience the Long Gallery as it was meant to be all those years ago, a “storytelling sequence”.